On 20th March, 2018, a 16-member Parsi delegation from Mumbai and New Delhi met the H’ble Prime Minister Shri Narendra Modi at Parliament House, New Delhi. The delegation, organised and led by Dasturji Khurshed K. Dastoor, Zoroastrian representative at the National Commission for Minorities, constituted the following from Mumbai – Havovi Khurshed Dastoor, Sam Bulsara, Er. Dr. Ramiyar P.Karanjia, Hoshaang Gotla, Zubin Khapoliwala, Tina Patel, Areez Patel and Natasha Dubash. 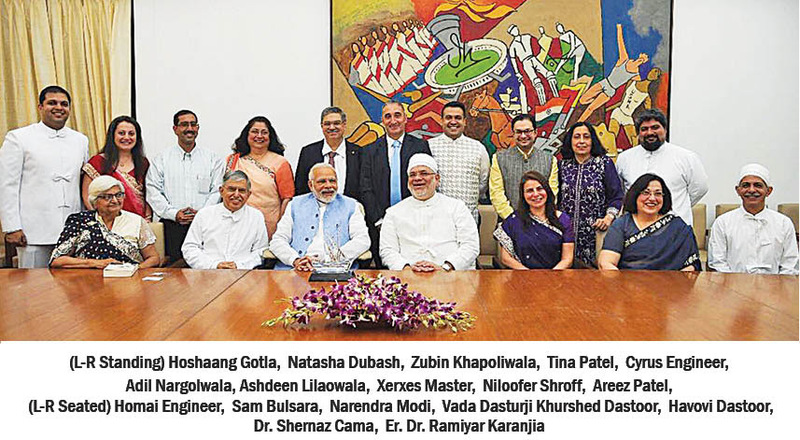 From New Delhi, four Trustees of the Delhi Parsi Anjuman – Adil Nargolwala, Cyrus Engineer, Ashdeen Lilaowala and Niloofer Mistry were part of the delegation, as also were Dr. Shernaz Cama and Homai Engineer. The delegation reached the Parliament House at 10.45 am and within a short time, the Prime Minister graciously met the delegation. Dasturji Khurshed and Er. Dr. Karanjia initiated the proceedings by showering blessings on Shri Narendra Modi and later Dr. Karanjia explained the meaning of the Avestan benedictions. Each member of the delegation was briefly introduced and they highlighted the work they were doing for the community and the nation. The Prime Minister, in his brief address, said that he was very fond of the Zoroastrian community and being with the Parsis, even for a short time, was a sure way of dissipating the stress and tensions of the entire day. He also complimented the Parsis for being a peace loving community and asked them to remain that way. He also mentioned that the young members of the Community should marry and multiply. The delegation took the opportunity to put certain proposals before the Prime Minister. They requested the Prime Minister to confer Bharat Ratna posthumously on Field Marshal Sam Manekshaw and that a prominent road in New Delhi be named after him. Dr. Shernaz Cama requested the PM to grant them a place for a permanent exhibition of 100 years of Parsi Theatre. The PM assured that he will instruct the proper persons to assist in this process. On this cue, the PM appreciated Parsi theatre and fondly remembered Yazdi Karanjia, the thespian senior theatre artist, and expressed his desire to see Parsi theatre (Gujrati rangmanch). Dasturji Khurshed requested the PM to help the community in getting endowment seats for Parsi students in Professional Colleges all over India. He also briefed the Prime Minister about the success of the first and second Iranshah Udvada Utsav held in December 2015 and 2017. He was also informed about the activities of XYZ (Xtremely YoungZoroastrians) and the social service done by the children of the community involved in Making A Difference. The delegation presented flowers, gifts and momentos to the PM Modi and he warmly greeted Jamshedi Navroz to the entire delegation and asked that his good wishes be conveyed to the entire Community.